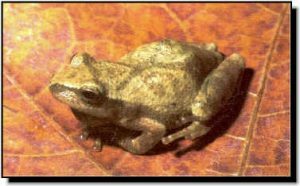 Comments: The spring peeper is a small frog measuring just over 1-inch. The “crucifer” in its scientific name refers to the dark “X” marking on its back. The spring peeper gets its common name from the plaintive peeps the male uses to attract females at temporary woodland pools in late winter or early spring. This frog is found in the extreme eastern counties of Kansas. The range of the spring peeper covers most of eastern North America. Kansas is on the western periphery of the spring peeper’s natural range. Although it is a common species in states further east, it is considered rare within the state of Kansas.